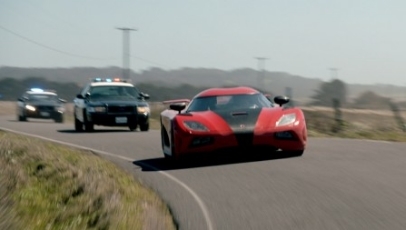 Adapted from the long-running, hugely successful multi-platform racing series, Need For Speed is the definition of a missed opportunity: a super-charged film that’s potential has been thwarted by an uninspired screenplay, underwritten characters and dull, lifeless action sequences that pales in comparison to a mere iota of what’s been seen and done numerous times in the Fast And Furious franchise – a comparison that proves too obvious to avoid. Imprisoned for a crime he didn’t commit, street racer Tobey Marshall (Aaron Paul) returns to the outside world with a vendetta: to bring down sports car entrepreneur Dino Brewster (Dominic Cooper) and avenge the death of his friend Pete (Harrison Gilbertson). His chance for redemption comes in the form of a pretentious mega-bucks race in California dubbed the DeLeon. The only problem is, he has only 48 hours to make it there before the race starts. Only ever moderately thrilling, Need For Speed offers up one or two impressive set pieces, but most are either over-shot by director Scott Waugh or terribly edited. The film, too, is stretched out far beyond its merit, meaning much of what happens in between the so-so car chases proves even more of a chore to sit through, with George Gatins’ lumbered screenplay weighed down heavily by hackneyed dialogue and one-dimensional characters. Paul does the best with the material, but it’s not a terrific start for an actor coming off the back of one of the most-loved TV shows of recent memory, as there’s no real meat to his characters arc, aside from sad rage, for him to stick his teeth into. Cooper fairs even worse in the villain role, and Imogen Poots is reduced to a serviceable supporting role, but at least shares decent chemistry with Paul and a few moments of humorous wisecracking. It all comes to a laborious conclusion with a ridiculously overplayed finale that lasts around twenty minutes longer than it needed to. Need For Speed was never going to be a film with a great deal of depth of emotional nuance, but much of what comes to pass here is embarrassingly middling for a piece of work packed with able actors and a narrative that, with some trimming here and there and a shot of pure adrenaline, could have been something.